Eingang/ warmup: zum Club ist an der Seite. Stahltreppe hoch. Cosmo Club. Come early, stay till late. see you later. Timetable soon. 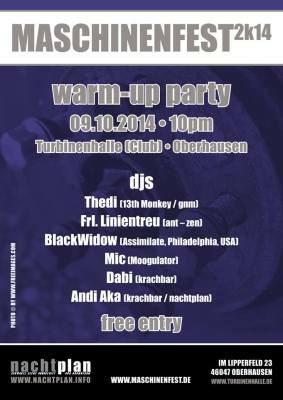 FB Link WARM UP – the flyer has not been updated so refer to the list above. und der eigentliche Live-Hauptblock 10-12.10. 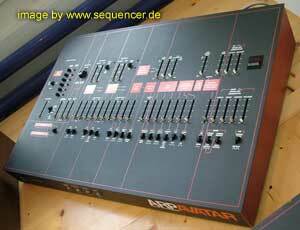 – Moogulator spielt am Sonntag um 16:00. Maschinenfest ist zwar Industrial – aber für Offenheit bekannt, wird bestimmt interessant durch div. Genres. the main part is the live performance one plus DJs and booths and talk and people in the other hall – Maschinenfest is mostly dedicated to Industrial but open in general, so worth a look. -> 9. 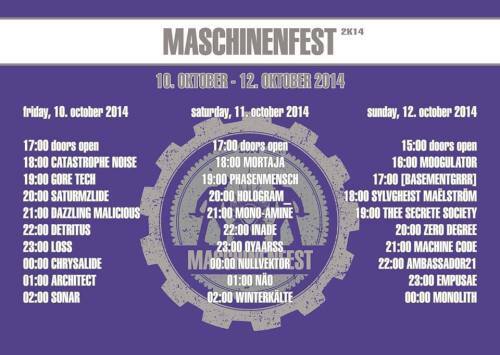 – 12.10.2014 Maschinenfest 2k14, Oberhausen, Turbinenhalle (Moogulator live) | Moogulator. The Site is up for tickets and stuff NOW! get tickets THERE as well! btw: want CDs or Vinyl? Just ask me there! I will be present all the time, just talk to me.